Unmanned Aerial Vehicles(UAVs), Micro Air Vehicles(MAVs), Unmanned Marine Vehicles(UMVs), Underwater Vehicles(UVs), Air balloons and blimps, Micro-satellite, Multi-agent systems, Autonomous Ground Vehicles(UGVs), Blimps, Swarm intelligence, Autonomous Flying Robots(AFRs), Flapping Robots(FRs), Satellite and spacecraft technologies, Missiles and rocketry, Autonomous control of unmanned vehicles. 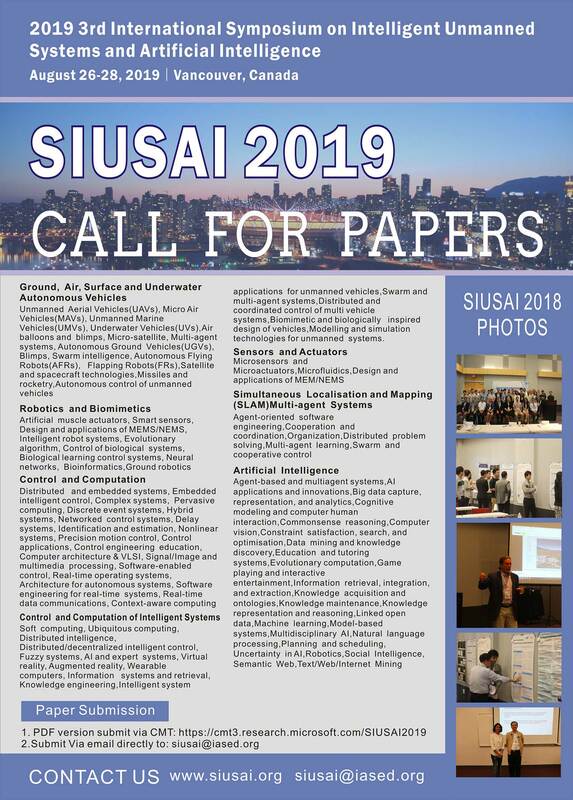 Artificial muscle actuators, Smart sensors, Design and applications of MEMS/NEMS, Intelligent robot systems, Evolutionary algorithm, Control of biological systems, Biological learning control systems, Neural networks, Bioinformatics,Ground robotics. Distributed and embedded systems, Embedded intelligent control, Complex systems, Pervasive computing, Discrete event systems, Hybrid systems, Networked control systems, Delay systems, Identification and estimation, Nonlinear systems, Precision motion control, Control applications, Control engineering education, Computer architecture & VLSI, Signal/Image and multimedia processing, Software-enabled control, Real-time operating systems, Architecture for autonomous systems, Software engineering for real-time systems, Real-time data communications, Context-aware computing. Soft computing, Ubiquitous computing, Distributed intelligence, Distributed/decentralized intelligent control, Fuzzy systems, AI and expert systems, Virtual reality, Augmented reality, Wearable computers, Information systems and retrieval, Knowledge engineering, Intelligent system applications for unmanned vehicles, Swarm and multi-agent systems,Distributed and coordinated control of multi vehicle systems,Biomimetic and biologically inspired design of vehicles, Modelling and simulation technologies for unmanned systems.